The Leader’s Institute ® has an ongoing partnership with Allergan, a global pharmaceutical company. 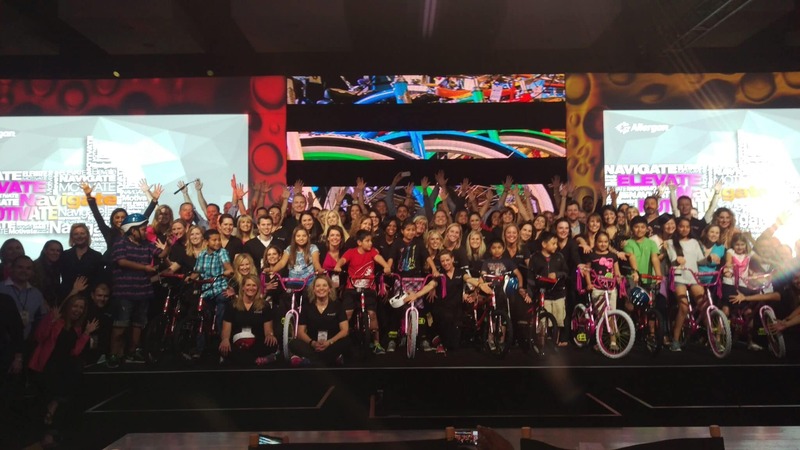 When Allergan’s urology department had a national meeting in San Diego, CA, they asked The Leader’s Institute ® to do a Build-A-Bike ® bike team event in San Diego. This was an extremely energetic and competitive group. Each group comes up with a cheer to bond with their teammates, and these cheers were outstanding! There were several human pyramids, cartwheels, and even some back handsprings! After the cheer portion, the groups had to work together to solve clues. Once they solved the clue correctly, they would earn a part to a bike. Even though Los Angeles based instructor Chris McNeany told this portion of the event was not a competition, these groups were determined to finish building their bike first. The bikes are only complete once they have been given a safety check approval. This was a fantastic group to work with, and the kids coming at the end to receive the bikes was a total surprise. The Leader’s Institute looks forward to working with Allergan on future events! Feel free to call one of our team building experts for details about conducting an event for your team or group. Our event planners can custom design programs for your group, and since we have instructors in Southern California, no travel fees are added to your investment!